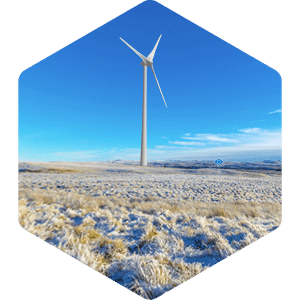 Compare different design alternatives of your proposed wind farm, such as location of the turbines, turbine types, number of turbines etc. Search and plan with different coordinate systems in Windplanner. Support for Lat-Lon and all other local formats. On the left screen in Windplanner. On this map you can see the icons of the turbines and the viewpoints. You can add different layers to this 2D map. 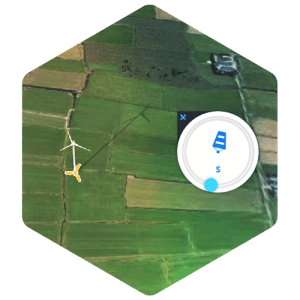 View turbines in a 3D world. With global coverage of buildings, trees, terrain height, existing & proposed wind turbines. Import different layers. Supported formats Shapefiles, ARCgis, statem, Xyz, Geojson. No GIS layers available to link or import? Simply draw on the 2D map to explain design decisions. Place multiple turbines in line and grid. Ex- & Import turbine layouts to-and-from different applications (please let us know if your file format is not yet supported). 2D map overlay "Risicokaart", Holland-only. Draw solar fields with the upcoming Solarplanner-module. Add offshore base to turbines. Catalogue with many different turbines such as Enercon E141, Vestas V110, Nordex N117 and more. Select 3D turbines from the catalogue. Freely adjust hub height, rotor diameter & lighting. Select date & time, with corresponding shadows (365-days) and adjustable turbine light frequency & sync. Tip speed in m/s (increase diameter=decrease rpm). Adjust frequency and light settings. Easily change the direction of the wind. Change visibility with sunny, cloudy and misty weather types. 2D map layer with year-round shadow casting depending on turbine properties. Terrain-dependant dB(A) levels as a dynamic map and audible sound. 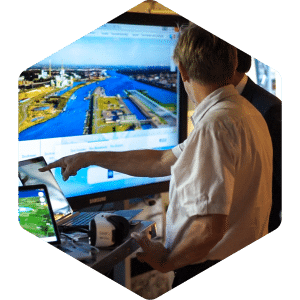 View and analyze the visual impact in spherical panoramas from multiple suppliers like Google Street View, Cyclomedia or from your own photos. Use your own panoramic images and position them quickly & precise. Adjust the altitude, pitch and angle of view to zoom in or out. Visualize WindSim turbines and layers in Windplanner, and export to WindSim. 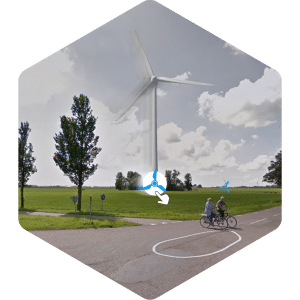 View turbines directly within Cycloramas. See example below - Photomontages. Photogrammetry & custom-built 3D terrain (on request). For instance green Enercon base and red-striped wing tips. Share selected viewpoints with residents, colleagues, authorities & decision makers and collaborate with your colleagues in one workspace. Save JPG files in high-resolution. Show life-like scale with Google Daydream or Cardboard VR-glasses. To public or boardroom. Real Time Remote Control. Create detailed PDF reports with viewpoints, turbine details and map view. This could be helpful during the licensing phase. Create your own animation with fly-throughs from different viewpoints (movie file on request). Give stakeholders a voice and increase acceptance. Vote on Layouts, answer questions and even moderate group discussions. Completely new Editor: faster, responsive, and much easier. Use windplanner with your iPad and/or Android tablet. In-app support & checklist for creating realistic visuals. 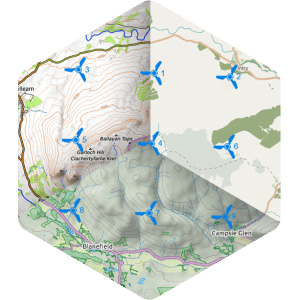 Turbine & viewpoint locations in 3D. Neural Network trained to automatically mask panoramas (turbines are placed in front of clouds but behind objects in photos). Quickly create a manual mask in case the automatic SkyDetect is insufficiently accurate. SkyDetect: this is a clever algorithm that cuts out the sky from a panorama, automatically creating photomontages that fit most cases. Manual Masking: with this tool, you can manually adjust the skyline if SkyDetect fails. And, for instance, if you want to position a turbine in front of the mountain but behind the trees. No mask: in this option, the turbine will be placed in front of all objects.